I went right off orchids on my wedding day. Blame the florist. She mixed her orders and delivered a bouquet with a greenish centrepiece of white lady’s slipper (probably a Paphiopedilum) that didn’t go with my cream dress. The world’s most popular potted plant is the Phalaenopsis orchid. My resulting meltdown could have been entered in the Guinness Book of Records and eventually I stomped down the aisle carrying gold chrysanthemums. Credit for changing my mind about orchids a few years later goes to a charming greenhood spotted in flower, in a bush-clad gully in South Otago. I don’t know which species it was, but as most greenhoods are now rare in the wild, I hope it’s thriving. 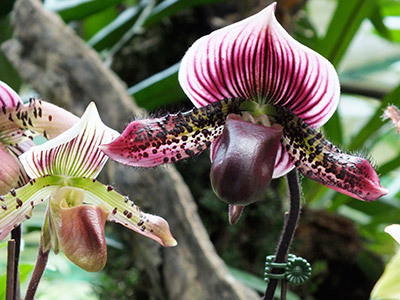 With 35,000 species and tens of thousands of hybrids, Orchidaceae is the largest family of flowering plants. Australia boasts the smallest species, Bulbophyllum minutissimum, which grows to about 3mm, as well as the bizarre Rhizanthella gardneri, which spends its life underground. Possibly the world’s tallest orchid is another Australian species, Pseudovanilla foliate syn. Galeola foliata, which can climb 30m or more, but the biggest is the Asian tiger orchid (Grammatophyllum speciosum) and a 800kg specimen in full bloom took top honours at the Orchid Society Of South- East Asia’s Singapore show in August. It was so big it had to be lifted into position by crane – not a task the average exhibitor would contemplate. Singapore has a love affair with orchids and, in 1981, chose Vanda ‘Miss Joaquim’ as its national flower. It is pink, but Vanda coerulea hybrids include some lavender and violet shades, although to my mind Vascostylis ‘Roberto Blue’ is hard to beat for depth of colour. Orchids come from every continent except Antarctica, with flower colour from green and brown, through white and pink to yellow, orange, scarlet and purples. Blooms can be one or more colours, spotted or striped, flat-faced or “horned” like the Masdevallia and some Dendrobium species. The showiest orchids are usually epiphytes, which perch on trees and have long aerial roots terrestrials grow in the ground from rhizomes, tubers or roots while a smaller group, the lithophytes, are found on rocks or cliff faces. Orchids that have thickened bulb-like stems (pseudobulbs) are called sympodial and include dendrobiums, yellow Oncidium ‘Dancing Lady’ – common outdoors in the tropics – cattleyas, cymbidiums, odontoglossums and epidendrums. Paphiopedilums are sympodial, but lack pseudobulbs. Monopodial orchids have a single stem with pairs of facing leaves. Phalaenopsis, Vanda and some New Zealand orchids, such as Calochilus and Microtis species, are monopodial. 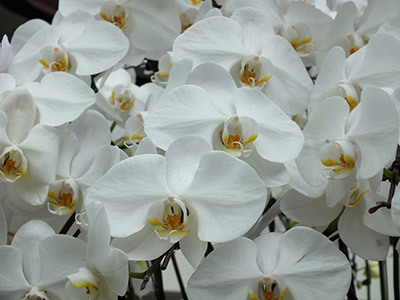 In cultivation, probably the most familiar are the moth orchids (Phalaenopsis), now the world’s most popular indoor plant. White is most common, but other colours, including delicate pinks, are increasingly favoured. Phalaenopsis are relatively easy to propagate and, from a nursery perspective, have the added advantage of being fast growing, able to go from babyhood to blooming in about a year. By contrast, cymbidiums and cattleyas take up to five years to start flowering, making them much more expensive, but despite this, the cymbidium orchid is a significant, export cut flower for New Zealand. Overseas growers are pushing miltonias (Miltoniopsis cultivars) as the next big thing. Whether the pansy-faced “milts” will overcome the competition from cymbidiums, “paphs” (paphiopedilums) or the ever-expanding range of Phalaenopsis hybrids, especially those being bred in Taiwan, is anyone’s guess, but it certainly makes the orchid scene interesting. Whether growing commercially or at home, the key to success is replicating as closely as possible the conditions in which orchids grow in their native habitats. This is why it is essential to understand whether your chosen plant is epiphytic or terrestrial, as this dictates how it is cultivated. In this country, most orchids are grown indoors, but because of their huge climatic range in the wild, there are plenty of outdoor options, most of them suitable for popping into the ground, although potted specimens can have their feeding and watering needs better catered for and the half-hardy varieties moved under cover if necessary. Paphiopedilum maudiae is one of the easiest paphiopedilums to grow. 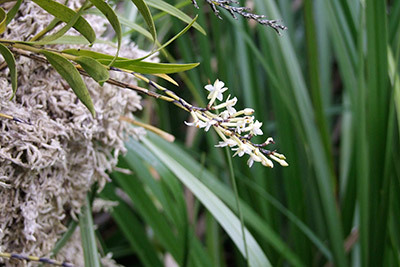 Probably the easiest to cultivate is the crucifix or reed orchid (Epidendrum orchid the exotic ibaguense), which can be left to its own devices and from Auckland north mayflower all year round. Although they enjoy the sun, too much will see the leaves turn a brownish colour and too little light not only reduces the number of flowers, but also encourages leggy growth. Strappy-leafed Bletilla striata, which grows to about 60cm, is said to be hardy down to zone 6, which should mean being able to grow it outdoors in any part of New Zealand. Cautious gardeners in the coldest regions may prefer to grow this deciduous terrestrial orchid in a pot and give it some protection in winter. Pleiones are lower-growing (20cm), half hardy deciduous orchids, usually pink, but there are white, lavender and yellow cultivars. As they are shallow-rooting, cultivate them in wide clay pots or pans and go easy on watering when flowering has finished. Size-wise, Dactylorhiza foliosa lies between bletillas (urn orchids) and pleiones. A bright cerise species from Madeira that flowers in late spring or early summer, it is ideal under deciduous trees if the site has adequate drainage. Among the hardier Australians that lend themselves to outdoor culture is the rock orchid (Thelychiton kingianus syn. Dendrobium kingianum). Think Sydney weather and you get an idea of the extremes this scented beauty will tolerate. Usually pink, it comes in lemon or greenish white forms, too, and a large plant in full bloom is a delightful sight. Cymbidiums have flowers up to 15cm across and a good spike may have 30 blossoms that will hold for a couple of months. Originating from subtropical Asia and Northern Australia, in the wild cymbidiums grow terrestrially and as epiphytes, but in the garden they are usually cultivated as potted plants or tucked in a sheltered corner. Although an established plant can cope with a few degrees of frost, flowers are damaged by chilly conditions, so protect them if sub-zero temperatures are forecast. Conversely, they dislike being exposed to hot midday sun. Easy to grow, with a wide range of colours available, they are tops for most gardeners. New Zealand native Earina autumnalis. Although New Zealand has more than 160 native orchid species, they are not sold by nurseries and it is illegal for anyone to sell the terrestrial species. Most are extremely difficult to grow, so don’t be tempted to dig any to try at home and don’t pick the flowers as that means no seeds from the stem. Many native orchids are increasingly rare, threatened not only by invasive weeds and browsing animals, but by smugglers. Two Czech men made history in 2004 as the first people charged with smuggling flora out of New Zealand.